Christopher got me a 50mm lens for Valentine’s Day this year so I could work on my photography, and I’ve been really eager to try it out. (And what better way to do that than by taking advantage of a beautiful day and hitting the UNF trails to see what it could do?) Because I’m still a padawan when it comes to photography, I’ve never owned a lens that only adjusted manually, so the goal of the day was to practice, practice, practice! I don’t think we could’ve asked for better weather – the sun was shining, there was a gentle breeze for the duration of our hike, and the humidity was next to nothing (for Florida anyway). The only hiccup to our perfect hiking weather was the miniature swamps that cropped up along the trail due to the deluge the area received the day before (and let’s be honest…it really did more to set the scene that we were actually on some grandiose adventure). 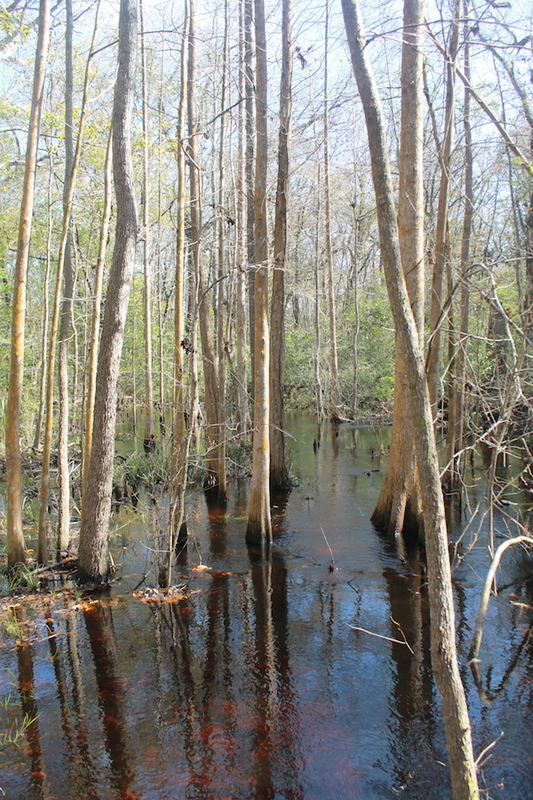 My favorite shot of the day was near the end of our hike after cutting a path parallel to our submerged trail so that we could make it to a bridge in the middle of the cypress swamp. The sun filtered through the treetops and created a mesmerizing kaleidoscope of highlights and shadows.